Data-driven brand and market studies to inform action. The oversaturated adTech ecosystem requires an insightful product differentiation strategy. Through research we uncover actionable insights that fuel such strategy: driving decisions, enabling strategic planning, and framing marketing pillars. Quantitative surveys form the backbone of much of our research, offering adTech-specific data at scale to answer hypotheses, drive analysis, and produce informed content. Studies begin with our 90K+ brand and agency panels – we identify and engage with a subset of this group based upon job level, expertise, relevance and purchasing power. Organic in nature, qualitative research provides anecdotal evidence and color that both stands on its own, and humanizes quantitative data. This one-on-one process uncovers buyer attitudes and beliefs, providing candid insights not found in quantitative data alone. Need data that directs your positioning and informs your marketing pillars? Is traditional market research too lengthy or cost prohibitive? One of most sought after services is our Essential Brand Perception Study. It’s designed to make market research accessible for adtech marketers. Engagements begin by conducting joint discovery with our clients, honing points-of-view and outlining clear objectives. This discovery, informed by unparalleled MadTech-insider acumen, results in hypotheses which are ready to be tested, challenged and validated by research. Effective survey design is crucial to meaningful data yields. Our research team works to accurately qualify respondents and discourage biases, while optimizing user experience to meet statistical thresholds. Industry Index surveys engage our unique, 140K+ expert panelists – identifying and engaging subsets of these potential respondents based upon job level, expertise, relevance and purchasing power. Analysis of research data allows us to work with our clients to identify topics and narratives that will stand apart from traditional marketing messages with custom content. This highly publicized study illuminated where and why marketers are challenged, and which group is best positioned to lead the way on cross-screen video platform adoption. 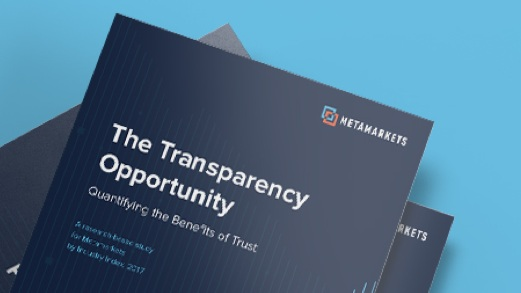 This quantitative and qualitative research study on behalf of Metamarkets defines how openness and transparency bring the greatest possible value and liquidity to the programmatic advertising market. Contact us to the research process today.